ATI Tools and Utilities include a variety of interesting functions; the other key tab is for Backup and Restore. 1. Rescue Media Builder lets you create a bootable CD, DVD, or UFD (USB Flash Drive), or build an ISO image from a bootable disk (a nice way to snapshot its contents in a mountable form). 2. Acronis offers an alternative to the F8 at bootup to launch Windows Recovery: strike F11 to launch Acronis Startup Recovery instead (which works with rescue media to give you access to existing and available Acronis and Windows backups). 3. Acronis Secure Zone provides a way to set up a password-protected disk partition in which to store backups (otherwise, anyone with administrative rights to a system can read anything and everything in that backup). 4. 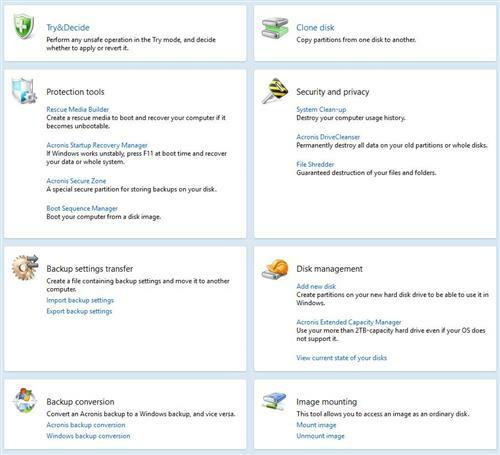 Backup settings transfer lets you capture backup settings from one PC (or VM) and move it to another PC (or VM); helpful for cookie cutter operations across multiple PCs and VMs. 5. Backup conversion can be handy in moving backups to and from PCs that don’t have ATI installed. 6. System Clean-up, DriveCleanser, and File Shredder are all workmanlike history and data erasure tools (DriveCleanser complies with US DoD 5220.22-M, while the File Shredder not only supports that standard, but 6 other standards as well). 7. The Extended Capacity Manager is a nice alternative to the Asus Disk Unlocker utility for those with drives larger than 2.2TB in capacity, and systems to old to mount such large volumes natively. 8. In the “saving the best for last” tradition, ATI’s backup and recovery remain second to none. I’ve never had a problem reading a backup after the fact, and the Mount/Unmount image utilities make any ATI backup mountable and browsable as a normal Windows file system in the form of a Windows (virtual) disk drive. The Disk Backup facility makes image backups easy to capture, while Recover makes them easy to restore. 1. The Boot Sequence Manager is designed to permit you to boot from any disk image you select as the source for boot-up, but in practice this works only on non-UEFI PCs because of restrictions on boot controls in their non-volatile RAM (NVRAM). 2. The same limitation (no built-in support for cloning UEFI boot drives) makes the Clone Disk utility useless for transferring the boot drive on such systems to another hard disk or SSD, because of the way that UEFI boot works. So far, the only tool I’ve found that works around this limitation is Paragon Software’s Migrate OS to SSD version 4.0. Acronis may remedy this on its next release, according to a recent conversation I had with company representatives, but it’s not yet a sure thing. Abbreviated info above, detailed below, but neither is terribly helpful or descriptive. I’ve talked to Acronis about allowing user tagging data to appear here, too. When you have dozens upon dozens of backups to look through, and not a lot of information to go on (except a cryptic system-assigned name or drive letter, the folder location, and capture date) , it can get frustrating trying to find the right item. Sure you can mount the backup and see what’s in there, but that takes more time than reading a user-defined tag or label. All in all, though, there’s still a lot more to like about ATI 2014 than otherwise. And for $49.99 (MSRP) it remains a good enough software buy that it goes on all my production systems.